Russia overtook France in 2017 to become Europe’s biggest cinema territory in terms of admissions according to provisional data on cinema attendance published by European cinema trade body UNIC. Around 213.6 million tickets were sold in the Russian Federation, compared to 209.2 million in France in 2017. This seismic shift highlights the present two-speed European cinema market, with territories in the east continuing to experience strong growth, while western EU states only recorded small growth or even decline in 2017. Overall growth for Europe was 2.1% in 2016, with over 1.3 billion admissions. The publication of preliminary figures comes from UNIC as well as from Media Salles (also expected is data soon from the European Audiovisual Observatory) on the eve of the Berlin Film Festival, with final figures announced in May at the Cannes Film Festival. The organisations have slightly different ways of collecting and interpreting the figures, but several key patterns are discernible, above all the massive growth coming from Europe’s emerging markets in 2017. While local films make a key difference in year-on-year growth, growth is also driven by the opening of new multiplexes, even in mature western markets such as The Netherlands. The double-digit growth of cinema in Russia, Turkey and Central & Eastern Europe is by the biggest story to emerge from these data sets. 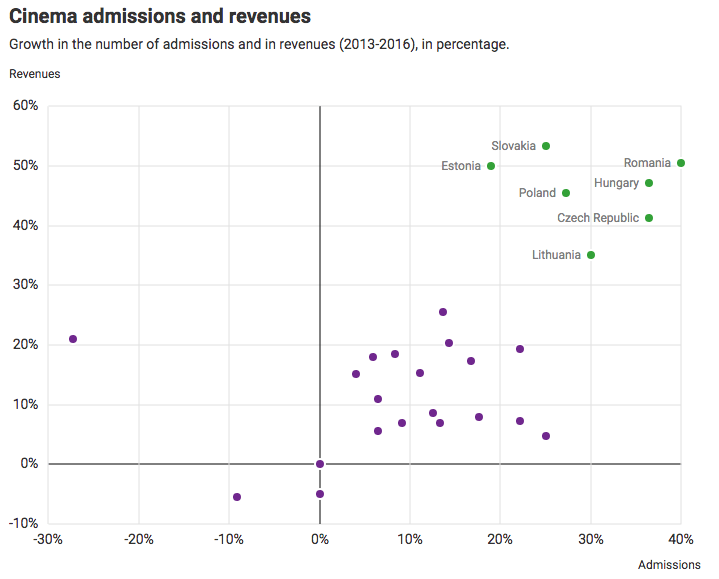 Russia recorded 9.3% year-on-year admissions growth and 11.4% box office growth [in local currency and unless otherwise stated UNIC data is quoted]. However, measured by box office the RUS R53,508 million is €753 million and thus still lower than France (€1,387 million in 2016), Germany (€1,056 million in 2017) and UK (GBP 1,277.9 million or €1,436 million), the latter of which is hence the larger BO in Europe at almost twice that of Russia. Admissions grew by double digits in several C&E European territories in 2016 including Bosnia and Herzegovina (17.8%), Lithuania (10.7%), Romania (11.3%), Slovakia (18.1%), Turkey (22.1%) and a staggering 32.2% in Ukraine as cinemas there rebuild, re-open and return to a semblance of normal after years of conflict. Media Salles also estimates 27.7% growth for the Serbian Republic, though UNIC pegs Serbia and Montenegro at 7.3%. Several other territories in the region recorded high single figures, such as Poland adding 8.7% and Romania having its tenth year of uninterrupted growth, with just Latvia and the Czech Republic dropping a a couple of percentage points, despite the later having its second-best year ever. Media Salles calculates an overall growth of 10.1% for what it terms C&E Europe and the Mediterranean Rim. After Russia it is Turkey that is the biggest growth story, crossing more than 70 million admissions. Overall 2016 marked a strong return to form for the C&E Europe region, which has recorded significant growth in both tickets sold and total box office, as seen in the chart above. Meanwhile overall EU territories saw an aggregated shrinkage of -0.6% according to UNIC, while Media Salles calculated a drop of -1.5% for 18 western countries that also included non-EU members (Norway, Iceland and soon also UK). 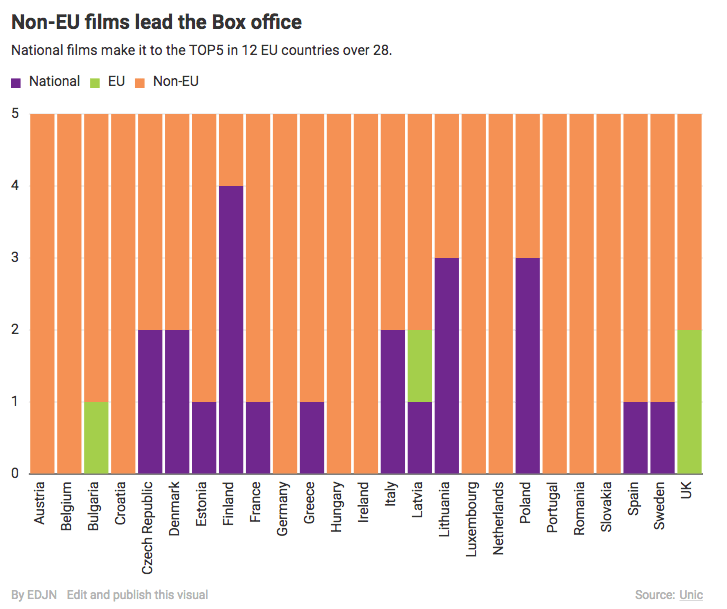 It was a mixed picture across Western Europe, driven by the success of local films. Germany’s “Fack Ju Göhte 3” helped the market grow 1%, and France had its third-best year in the past half century, despite the drop of -1.8%. Of the four big Nordic markets only Finland saw growth as all its Scandinavian neighbours saw admissions decline. In southern Europe Italy fared worst with a -12.4% drop in admissions and -11.4% in BO, while Spain fell just half a percent. Media Salles estimates Spain had +/-0% change with 101.2 million tickets sold, though UNIC believes that the country fell just short of the 100 million milestone. UK and Ireland had a good year, despite not having any significant local titles (“Dunkirk” was third and fourth respectively in those territories). The western success story was The Netherlands, which was 5.3% admissions growth, despite not having any local hits in the Top 5. This can be attributed to the opening of several new cinemas, as well as refurbishment and re-openings by the likes of Pathe NL, Kinepolis and Vue. The importance of new multiplexes can thus not be overstated either for emerging or mature markets. Refurbishments also play an important role and could help the UK in the coming year. Turkey was again proof that local films can super-charge a market, with the four highest of the Top 5 films all local (“Fate of the Furious” came fifth) and local films making up 56.7% of the cinema year 2017. France was saved by 37.4% local fares, though had “Valerian” (4th place) been better it might have been a year of growth. Finland’s 28% local films is what set it apart from other Nordic countries, with the year’s #1 title a local films. Meanwhile German exhibitors must be praying for a “Fack Ju Göhte 4”. While the fortunes of local-language film productions will vary, the bigger problems is that few European films tend to find a significant audience in the rest of Europe. Added to the fact that the biggest local hits tend to be comedies (Austria, Germany, Sweden, Poland, Turkey and several other countries in 2017), these have a particularly hard time getting people to buy tickets in other countries. This means that 2018 is likely to be a good year if Hollywood films perform as well as expected and that no big local hit from 2017 leaves a gaping hole in a particular territory. Yet it is the ongoing multiplex build out that shows no sign of abating in Russia, Turkey and C&E Europe that will see this region continue to grow for several more years. Media Salles 18 western territories had a collective admission figure of 881,9 million in 2017, while C&E Europe and Mediterranean Rim had half that at 447.4 million, meaning that the latter now makes up over one-third of the overall market of 1.329 billion in Europe. Yet many of the emerging markets should be best described as re-emerging markets, since they historically had high cinema going before the fall of communism. Single then screens have died off and are being replaced by multiplexes, typically controlled by a few major operators. And while organisations like Europe Cinemas encourage the cross-border screwing of European films, the film buyers congregating from tomorrow in Berlin know that there are more and more films than won’t get shown in most territories, even as the number of cinema screens and admissions grow.